How community action is helping vulnerable marine mammals stage a comeback in Madagascar. Life is slow in Andranomavo. Here, surrounded by mudflats and mangroves, time is governed by the tides and the seasons. When to go fishing, when to plant and harvest the rice—these are the markers that matter. But the current of change is running through this tiny community in Madagascar’s Nosy Hara Marine Protected Area, one of 20 villages in northern Madagascar embracing incentive-based conservation as a strategy to preserve and restore the region’s natural heritage. Nosy Hara is home to over 330 coral species, as well as 270 species of fish, five types of sea turtles, and migrating dolphins and whales. But the undisputed star of the marine protected area is the reclusive dugong. But while they might be rare, the dugong are an important part of this vibrant ecosystem, as well as a barometer of its health. 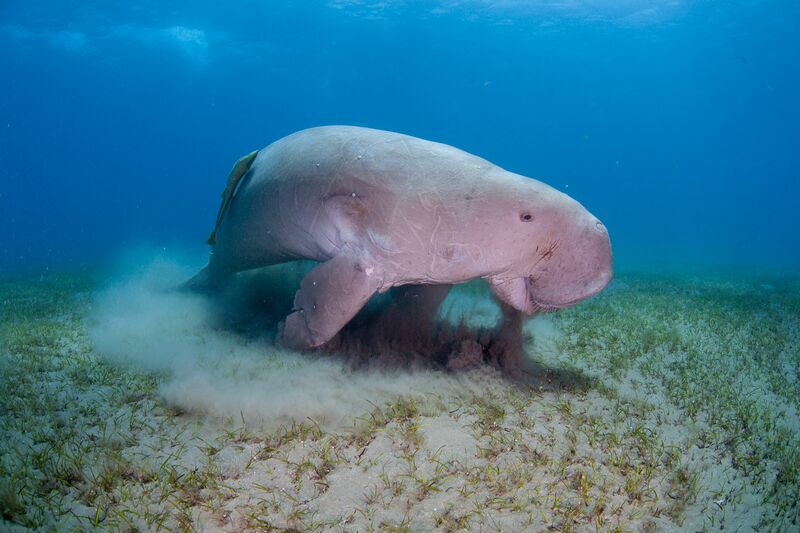 These shy herbivores depend on seagrass meadows to survive, each dugong grazing a territory of around 0.4 ha, contributing to nutrient cycling as they stir up sediment, and boosting seagrass growth as they fertilise the seabed with their dung. A healthy dugong population is both a sign of, and a contributor to, a thriving seagrass ecosystem. Just like coral reefs and mangrove forests, seagrass meadows are a vital part of coastal marine ecosystems. They provide habitat and breeding grounds for fish and shellfish, improve water quality and protect coasts from storm impacts. Seagrass also plays a key role in the fight against climate change, accounting for 10 per cent of the annual carbon sink capacity of the oceans, with healthy seagrass meadows storing up to 10 times as much carbon as the same area of healthy rainforest. But with 29 per cent of the world’s seagrass already gone, and an additional 11,000 ha disappearing every year—an area the size of a football pitch every thirty minutes—today, these marine ecosystems are amongst the most threatened on earth. “Coastal resources have been taken for granted for too long, not only in terms of their ecological function, but in terms of the human benefits they provide and their economic value,” UN Environment biodiversity expert Max Zieren says. With the dugong flying as its standard, the Global Environment Facility and UN Environment-supported Dugong and Seagrass Conservation Project is working to preserve these ecosystems at over 100 sites across eight countries (Indonesia, Madagascar, Malaysia, Mozambique, the Solomon Islands, Sri Lanka, Timor-Leste and Vanuatu), building awareness, developing policy, undertaking research and working with local communities to provide incentives for effective conservation. Accessible only by boat or a series of rough roads through the surrounding hills, Andranomavo epitomises the development challenges faced by many of Madagascar’s coastal communities. Generations of villagers here have relied on the sea to survive, supplementing their catch with subsistence rice and vegetable farming. So when Nosy Hara was declared a marine protected area in 2007, balancing local livelihoods and conservation became a top priority. But their long lifespans, slow breeding rates, and long gestation and nursing periods make dugong populations particularly vulnerable to overhunting. While they can live as long as 70 years, female dugongs only begin to breed at between six and 17 years of age, with a single calf born after a 13–14-month gestation period, followed by 18 months of suckling their young, and a further six years before the calf becomes independent. All of this means that even under the best of circumstances, the dugong population is only capable of increasing at a maximum of five per cent a year—far from a robust figure in the face of human predation and widespread habitat degradation. Building community awareness of the important role the dugong plays in the marine environment, as well as the importance of healthy seagrass ecosystems for their own livelihoods, has been a top priority for the Dugong and Seagrass Conservation Project and local partner C3 Madagascar. Damo, 56, is one of 40 conservation ambassadors trained by the project to help spread the message about marine conservation. Her role is also to help monitor the marine protected area and report infractions of regulations on fishing and other activities to park authorities. In a community where 80 per cent of the population are fishermen, it’s a message that hits home, and one that has helped create the conditions for a slow return of the gentle giants to feeding grounds in Nosy Hara. Just as important as changing community attitudes, though, has been addressing the development challenges facing Andranomavo’s 300 residents. In Nosy Hara, this has meant incentivising the community to take an active hand in managing the marine protected area, along with introducing livelihood alternatives that reduce pressure on the bay. With healthcare amongst the top priorities of the local community, the Dugong and Seagrass Conservation Project is supporting regular visits by a doctor and a midwife to Andranomavo—a welcome change in a village where seeing a doctor previously meant a two-hour walk to the nearest clinic, whether pregnant, elderly or infirm. The project is also helping diversify livelihoods around the region to ease reliance on the marine environment. Working with local women’s associations, the C3 Madagascar team has provided training and equipment to kickstart new businesses in hospitality, handicrafts and animal husbandry. Alongside her role as a conservation ambassador, Damo is one of 20 women who have taken up duck farming to supplement her income from fishing for shrimp and crabs. “The duck farm gives us an advantage because we don’t have to rely so heavily on fishing,” she says. Damo’s duck business might seem like a small change at on an international level, but with over 1 million hectares of dugong habitat now under improved conservation management across 30 sites in Madagascar alone–and another 41 projects underway worldwide—these individual changes have the potential to stack up to big wins for the dugong and other species that rely on seagrass globally, including us. Meanwhile, as the tide rolls in in Andranomavo, there is a sense of optimism: thanks to the efforts of people like Damo, the dugong are back again.